Montague: The Tip of New Jersey ~ The History Girl! The Delaware River community of Montague Township, New Jersey, is the state’s northernmost town and home to High Point State Park, the state’s highest elevation. A community with a rich colonial history, it was almost lost in the early 1960s to a federal government project, but thanks to the work of local volunteers, the history of this community has been revived and is marching forward. The Foster-Armstrong House, circa 1790. It is unclear to this day for whom Montague is named. In England, at the time of the community’s establishment, there was a literary woman named Lady Mary Wortley Montague, eldest daughter of the Duke of Kingston. She wrote works which attracted great attention. There were also the first and second Dukes of Montague, both famous in English history, and John Montague, solicitor, who was a subject of controversy in the colonies, being a counsel for the New York Proprietors concerning the land grants. Also, there was a Sir Charles Montague, who had been a member of the king's privy council, chancelor of the exchequer, and formerly a member of the Board of Trade in England. Regardless of who it was named after, it is evident that the name Montague was prominent in England and the name was most likely suggested by King George II, who approved the royal patent on March 26, 1759. However, Montague had been settled as early as 1701 and had been under the control of the Dutch until 1664. A Dutch Reformed Church was organized in Montague in 1737. As throughout most of colonial New Jersey in the mid-1700s, the first major industries to develop in Montague were sawmills, grist mills, blacksmiths, tanneries and small dry goods stores. The sporadic settlement eventually led to the small hamlets of Brick House, Millville, and Tappentown/Duttonville. The hamlet of Brick House contained a hotel, numerous businesses, and a post office – thus it was considered the "Village of Montague." Montague was incorporated as one of New Jersey's initial group of 104 townships by an Act of the New Jersey Legislature on February 21, 1798. River crossings to the Pennsylvania side were by ferry until the bridge to Milford was built about 1829. Not far from the present-day Route 206 bridge to Milford sits the Foster-Armstrong House. 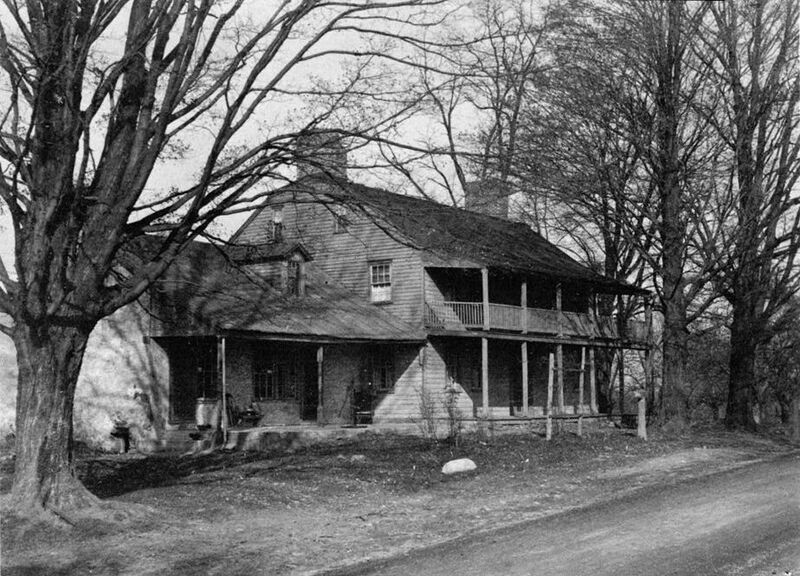 The main, two-story section of the home is believed to have been built in the 1790s by Julius Foster as a public house, or tavern. Foster purchased three tracts of land from Roger Clark, totaling sixty-six acres. This wood frame portion of the house is more characteristic of coastal Dutch architecture than of the upper Delaware Valley. It features a five-bay, center hall design with a Dutch door and is two rooms deep. The stone portion of the home was added sometime after 1820 by Foster's son-in-law, James Britten Armstrong. Both Foster and Armstrong operated sawmills and it can be surmised that they supplied the building materials for the respective sections of the home. Records indicate that Foster and Armstrong also operated a ferry approximately 1800 to 1835, a distillery, general store and blacksmith shop in the vicinity. Incomplete tavern license records indicate that Foster ran a public house, or tavern, in 1798-1799, further supported by a 1916 newspaper obituary of George Armstrong, who had owned the property since 1856, noting that there was an inscription in the house "dated 1817, stating that this house had been for a long time known as a road house." At some point during the late 1790s, a two-story porch was added to the front of the home, common of taverns. The porch was removed at some point in the 1930s and replaced by the current one-story porch. An undated image of the Foster-Armstrong House showing the two-story porch. The house was owned and occupied by the Armstrong family until the 1970s. In 1993, the Montague Association for the Restoration of Community History entered into an agreement with the National Park Service to operate a museum at the site. Many of the old homes in Montague were purchased by the Army Corps of Engineers for the 1965 Tocks Island Dam Project. The project never materialized and the vacant homes sat deteriorating for many years before being torn down. The reservoir of the proposed Tocks Island Dam would have inundated thirty miles of the Delaware River and 30,000 acres of its river valley (now part of Delaware Water Gap National Recreation Area). The defeat of the dam was an early victory of the environmental movement. However, much of the area’s local history suffered from the initial acquisition stages of the failed project. Today, the Delaware Gap National Recreation Area, established in 1965, encompasses the 40 mile river valley and nearly 70,000 acres. Traveling south on Route 206 is a rustic but quaint stone house built in the early 1800s. The vernacular stone home is named for George Nelden who arrived in Montague in 1820, and for the Roberts family who also later owned the farm across the road. For a period in the 1820s, it served as a schoolhouse, with quarters for the teacher on the second floor. This property was also acquired by the Army Corps of Engineers for the Tocks Island Dam project. In 1981, the Montague Association for the Restoration of Community History became the home’s caretakers. The main room of the home is set up as it may have appeared in the 1820s as a schoolroom. Upstairs, the school teacher’s bedroom has been recreated. Next time you want to travel to a serene and breathtaking wonder of New Jersey, much like the resort dwellers of the 1800s, consider a visit to Montague and the surrounding natural areas, full of trails for walking and hiking, wildlife and flora, and of course a dose of history.